When I first heard that there was going to be this show, my first thought was, "What? A show centered around a somewhat bland supporting character from FAMILY GUY?" But I decided I would give the show a chance. After all, there have been stranger premises that have worked. 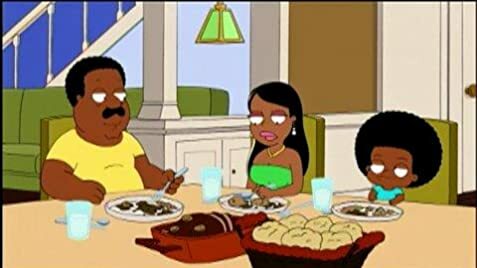 Later, I found out that the character of Cleveland Jr. had been changed from a (hilarious) hyperactive young boy into a fat and slow teenager. But I decided I would still give the show a chance. Maybe this revised character would be funny. A day before the show first aired, I was surfing the Internet and came across a selection of reviews of the show. They were almost all negative. But I was still willing to give the show a chance. Sometimes critics are wrong. The next day, I watched the pilot episode. It was terrible. But I decided I would still give the show a chance. Sometimes writers need time to polish their writing for a new show. As I write this, I've watched some more episodes of the show. And I think I can say now that this show simply doesn't work. It's not very funny - it seems to be written by teenaged fans of FAMILY GUY who have no professional writing experience. Not only that, the show is cursed by some characters that are a major turn-off. They are not only written to be annoying, they have some of the worst voice acting I've heard in a cartoon series. This show will get no more chances from me. Cleveland's son, Cleveland Brown Jr., was rarely seen in 'Family Guy'. When he did make an appearance though, he was not large and did not wear glasses, unlike how he appears in 'The Cleveland Show'. Cleveland Brown: Unlike you, I don't see age, gender or race. I would expect a middleage black woman to understand that.